FCA’s Ram Brand has doubled down on its relationship the Texas Rangers. A year ago, the company donated $100,000 to the Texas Ranger Hall of Fame and Museum, which is undergoing a complete renovation. This time, Bob Hegbloom, Ram Brand President, unveiled a one-of-a-kind concept truck designed to celebrate the role of the Texas Rangers from their founding in 1823 to its 200th anniversary in 2023. The truck will tour Texas and become a display when the renovation is completed. By way of some Ranger history, the first Rangers protected ranches, farms and settlements on the frontier. The nation’s oldest state law enforcement agency served under the Mexican, Republic of Texas, United States, Confederate Texas and the U.S. again during its history. Today, the agency has 213 full-time employees including 150 commissioned Rangers. Reflecting the times, it addresses border security, joint operations, intelligence, and special weapons and tactics. The truck, first shown at the Dallas Auto Show, is based on the Ram 1500, the highly acclaimed pickup that is the first in its segment to offer a diesel engine. That power plant today accounts for about 20% of Ram 1500 sales. 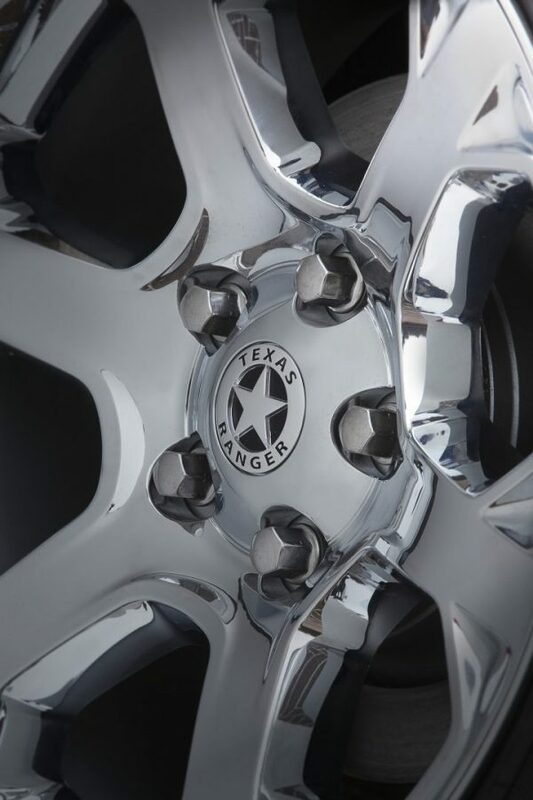 On the outside, the Ranger edition is identified by badging that represents the Mexican five-peso coins from which the iconic star badge was derived. The five-point aluminum emblems are visible on the front driver and passenger fenders. An additional one is featured on the tailgate. The 20-inch polished-aluminum wheels also get the symbol on the center caps. The truck — one-of-a-kind — is painted bright White with a compatible bright silver metallic — represents the white hats and silver badges identified with the Texas Rangers. On the interior, design cues also play off the Ranger heritage. The brown and tan leather and tooled details — both in aluminum and in stitching, are the same as those on the Laramie Longhorn edition, which is pure Texas. But this is no off-the-shelf commemorative. Real Mexican five-peso silver coins are inlaid in the wood portion of each door bolster — front doors are “heads” and rear doors are “tails”. The wood, repeated throughout the truck is open-pore walnut. The instrument panel badge notes the 1823 founding year of Texas Rangers and the center stack, console, door spears and seat trim bezels have a simulated metal decorative finish. One feature which captured a lot of broad interest was the vault that is hidden underneath the console lid. While it cannot be described as a gun vault, it was clear that it could serve that purpose if it became available as a Ram Truck accessory. 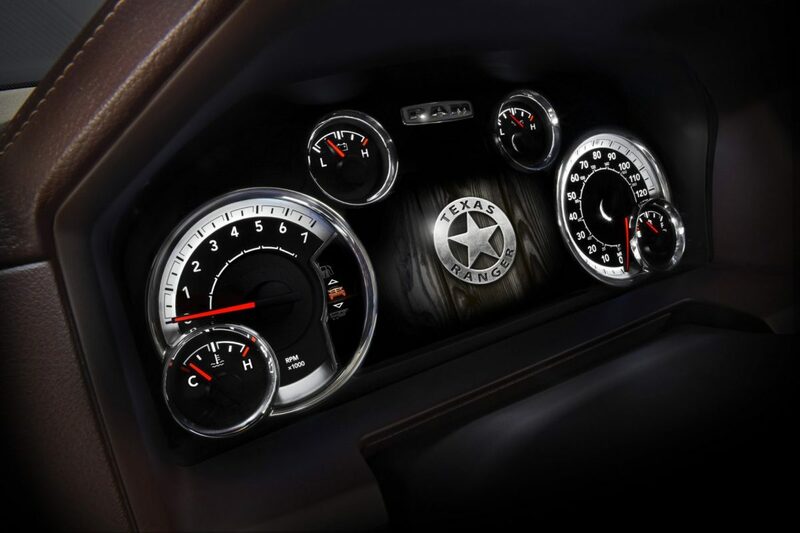 Other interior adornments set the Texas Ranger edition apart included special seat badges, badging on the gauge cluster, a graphic theme on the UConnect center console stack, and several others that shout that this is a special Texas edition. A possible production run has not be ruled out, but I don’t expect it to be announced any time soon. Of course, a 2023 Ram 1500 special edition featuring any new bells and whistles that the brand adds between now and then would certainly be a bang up way to celebrate that 200th anniversary.